IT was the afternoon of the Old Firm game, Rangers v Celtic at Ibrox, Saturday January 2 1971. The match was heading for a 0-0 draw when Jimmy Johnstone broke the deadlock to give Celtic the lead in the 89th minute. Then, with just seconds left on the clock, Colin Stein snatched a dramatic equaliser for Rangers. The blue section of the 80,000 all-ticket crowd went wild with delight. The green was thrown into despair. Two goals in a minute. What a finish! Yet, unseen amid this sea of emotions, a disaster was beginning to unfold at the Rangers end of the ground over on the East terrace at Staircase 13. As the fans swayed away from the heaving mass, some stumbled halfway down the steep steps. Those around didn’t see them fall and continued their descent. Suddenly a tidal wave of fans was engulfed in a terrifying crush. Steel barriers crumpled under the impact. When the carnage cleared, 66 people had lost their lives and more than 140 lay injured. Among the dead were 31 teenagers. The youngest victim was a boy of nine, Nigel Pickup, who had travelled to the game from Liverpool. One woman was among the fatalities. Margaret Ferguson, an 18-year-old from Maddiston near Falkirk, had made a doll for the baby daughter of Rangers centre-forward Stein – the man who scored the late equaliser – and had delivered it to his home just before Christmas. Five schoolboy pals, four of whom lived in the same street, had gone to the game together from the small town of Markinch in Fife. The five, all members of Glenrothes Rangers Supporters Club, never returned. Both sides of the Old Firm put aside their rivalries and came together to play a game to raise funds for the victims’ families. A combined Rangers and Celtic team took on a Scotland XI at Hampden watched by 81,405 fans. The club and their fans were in mourning. It was the blackest day in the history of Scottish football. On the 30th anniversary of the tragedy a special service was held at Ibrox and a bronze statue of John Greig was unveiled on top of a memorial to those who had been killed. Every year at the home game closest to the anniversary, the club pays its respects to those lost by laying a special wreath at the Memorial which was built in honour of those who died and other victims at the stadium in previous years. Bryan Todd, Robert McAdam, Peter Wright, John Gardiner, Richard Bark, William Thomson Summerhill, George Adams, John Neill, James Trainer. Richard Douglas Morrison, James Whyte Rae, David Douglas McGee, Robert Colquhoun Mulholland, David Ronald Paton, George McFarlane Irwin, Ian Frew, John Crawford, Brian Hutchison. Duncan McIsaac McBrearty, Charles John Griffiths Livingstone, Adam Henderson, Richard McLeay, David Cummings Duff, David Fraser McPherson, Robert Lockerbie Rae, Robert Campbell Grant, John McNeil McLeay. David Anderson, John Buchanan, John McInnes Semple, John Jeffrey, Robert Maxwell, Matthew Reid, Alexander McIntyre, Peter Gilchrist Farries, Thomas Melville. John James McGovern, George Wilson, Robert Charles Cairns, Hugh McGregor Addie, James Yuille Mair, Margaret Oliver Ferguson, Robert Turner Carrigan, George Alexander Smith, Walter Robert Raeburn. Andrew Jackson Lindsay, Charles Dougan, William Mason Philip, Russell Morgan, Peter Gordon Easton, George Crockett Findlay, Charles Stirling, Thomas Dickson, James Graham Gray. Thomas McRobbie, Ian Scott Hunter, Nigel Patrick Pickup, Russell Malcolm, Alexander Paterson Orr, Thomas Walker Stirling, James William Sibbald, Frankie Dover, Walter Shields, Thomas Grant, William Duncan Shaw, Donald Robert Sutherland. 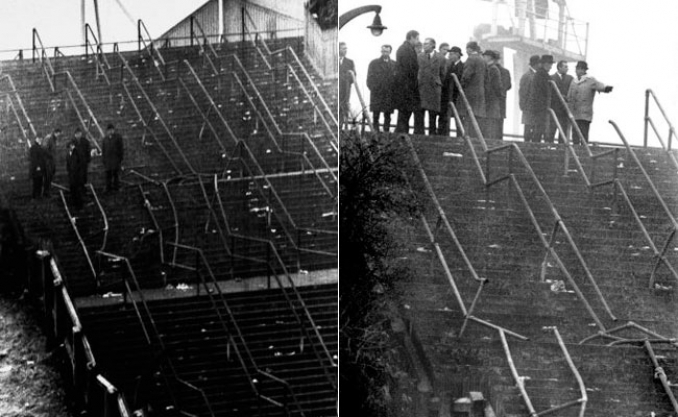 Sadly, the 1971 disaster was not the first time that tragedy had struck at Ibrox. Ten years earlier, two people died on Stairway 13 and 44 were injured and there were two other incidents in the intervening years, although thankfully no fatalities. In 1902 horror struck when the old wooden terracing collapsed under the weight of too many spectators when Ibrox hosted the Scotland v England international match. A gaping hole opened up and people plunged below. A total of 25 people died and 587 were injured but remarkably the game continued with many people crammed into other areas of the ground unaware of what was happening. The match was replayed at Villa Park a month later, finishing 2-2. The proceeds, £1000, went to the Ibrox Disaster Relief Funds. The tragedy reinforced the belief that football grounds had to be designed differently and Rangers employed the services of renowned construction engineer Archibald Leitch who re-designed a safer Ibrox which began holding international matches again in 1909.